A high-touch, high-tech approach to effectively manage long term care policies. Through the use of industry-leading, evidence-based and data-driven clinical and technical protocols, LTCG fulfills its clients’ responsibilities to make prompt and accurate claim decisions, approve all eligible claims, and develop clinically-sound, comprehensive care plans. Throughout all of these efforts we also maintain compliance with all policy language and applicable regulations. Supported by full-time medical directors and a large staff of licensed health care practitioners, our care management staff employs proven methods for active claims management. We apply clinically-based guidelines to project stability of care needs over time and to identify and focus on those claimants with high potential for recovery. Among our clinical protocols are LTCG’s Episode of Benefit guidelines, the approval periods during which care needs are expected to remain stable so that timely reassessment of ongoing eligibility occurs. These approval periods are specific to the clinical circumstances of each claim. In determining them, we consider the primary diagnosis, comorbid conditions and, most of all, the potential for a return to independence. Technical direction provided by leadership staff, who have decades of insurance experience, gives our clients confidence that LTCG’s practices minimize complaints and address regulatory challenges. Our recent technological advances design to support these efforts include Electronic Plans of Care, auto-adjudication and an industry-best Unified Provider Database containing over 27,000 certified LTC providers and over 1,000 contracted LTC providers. 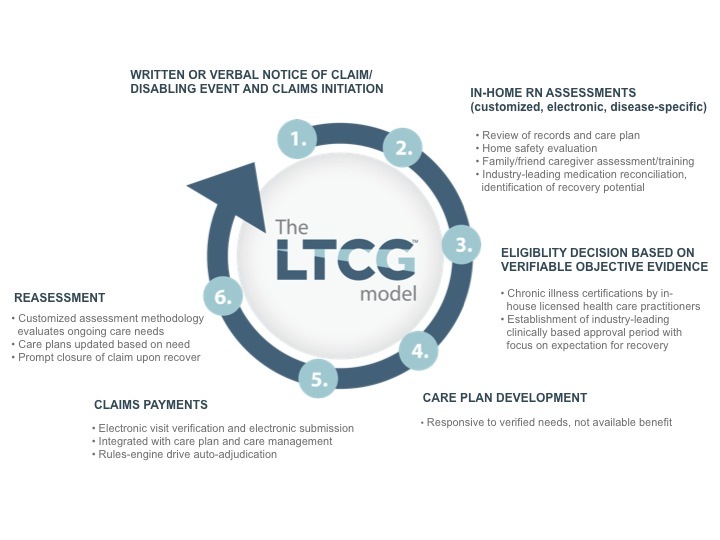 The LTCG model of claims and care management integrates care management and claim payment. Interdisciplinary teams share responsibility for ensuring that when the actual care in place is at odds with the level of care initially believed to be needed, prompt care management intervention occurs. We determine if the claimant has recovered or another change in their condition has taken place that warrants a care plan update or claim closure. To learn more about how we can provide end-to-end support of your business outsourcing needs from claims to care management, contact us.